Liberal Logic. . Wallpaper and background images in the Debatte club tagged: politics. No decent human being (which includes liberals) is okay with terrorists killing people. Period. Wow. Just wow. If you really think we're unresponsive to terrorism, then there's no talking to you. It's an absurd sentiment, and it's shameful that you'd post that on a website where people are trying to have reasonable conversations. Should I even bother mentioning that a "Muslim" is not someone who "kills a bunch of infidels"? We just call those terrorists. It's like that guy... Anders... that killed all those people and claimed he was a Christian. 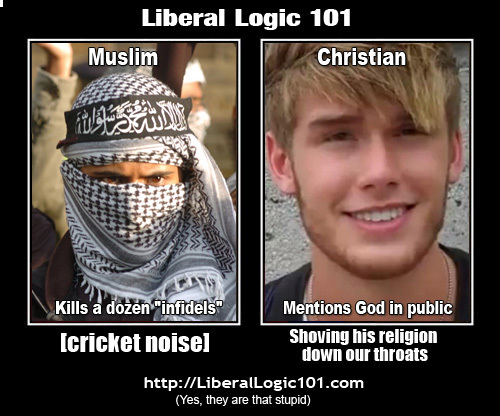 The conservatives were very clear in explaining that he wasn't really Christian, how could he be, if he killed people? Of course, they're right - he wasn't Christian. And neither is an extremist "muslim" truly Muslim. If you want to talk about hypocrisy, start there. ^Actually it's Muslim Terrorist, because it's a terrorist that is Muslim, and lol they're actually just following their holy book. Hateful Christians claim the same thing. The WBC is all about the bible while they spread their hate, fear, and propaganda. And songs. The Qur'an tells Muslims to become terrorists just as much as the Bible tells Christians to spread hate. "The Qur'an tells Muslims to become terrorists just as much as the Bible tells Christians to spread hate." Haha, the feeling is mutual.